Finally, some backpedaling on crazy talk about Antarctica, Glacier Ice Sheet Melt, Sea Level Rise, and LAX | Watts Up With That? 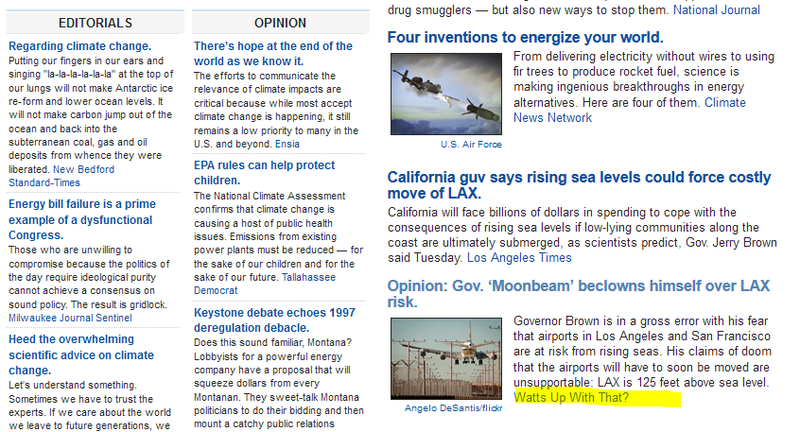 Below is a screencap of the “walkback” story headline in the LATimes posted late today. This morning, about 5:30AM, I sent a short but succinct letter to the Editor of the Los Angeles Times (reproduced below) regarding the statements made yesterday by California Governor Jerry Brown saying that the LAX and SFO airports would “have to be moved” due to effects from posited sea level rise caused by melting of portions of the Western Antarctic Ice Sheet, some 200-800 years in the future. The claim by Governor Brown, was patently ridiculous and I wrote about it here: Governor ‘Moonbeam’ beclowns himself over sea level rise at LAX airport. 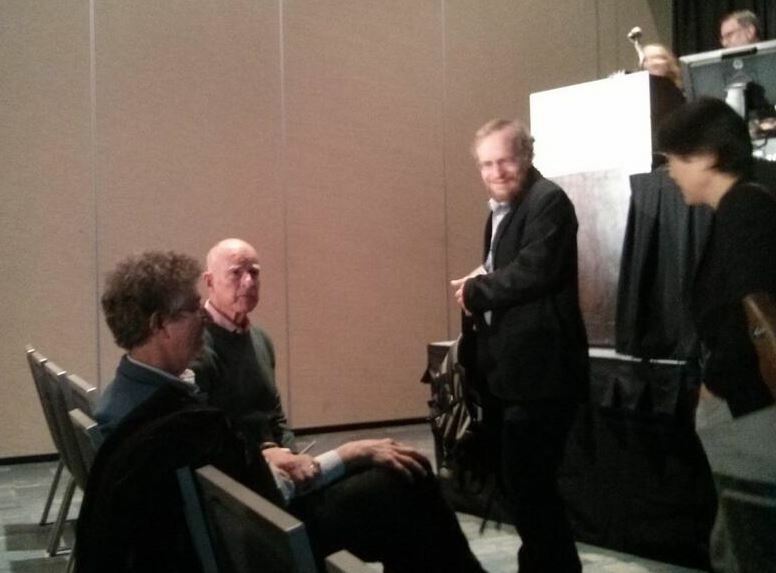 Worse, California governor Jerry Brown was in the audience and seemed to be quite taken with Alley’s brand of science and alarmism, particularly Alley’s depictions of San Francisco under water. I shudder to think what sort of influence Alley’s rantings might have on the people of California via Brown. Well, we found out yesterday. But various sources say that the nation’s third-busiest airport — bordered by the Pacific Ocean — has elevations ranging from 108 feet to 126 feet and is protected by higher coastal bluffs on the west side. “The governor misspoke about LAX,” said Evan Westrup, a spokesman for the Brown administration. 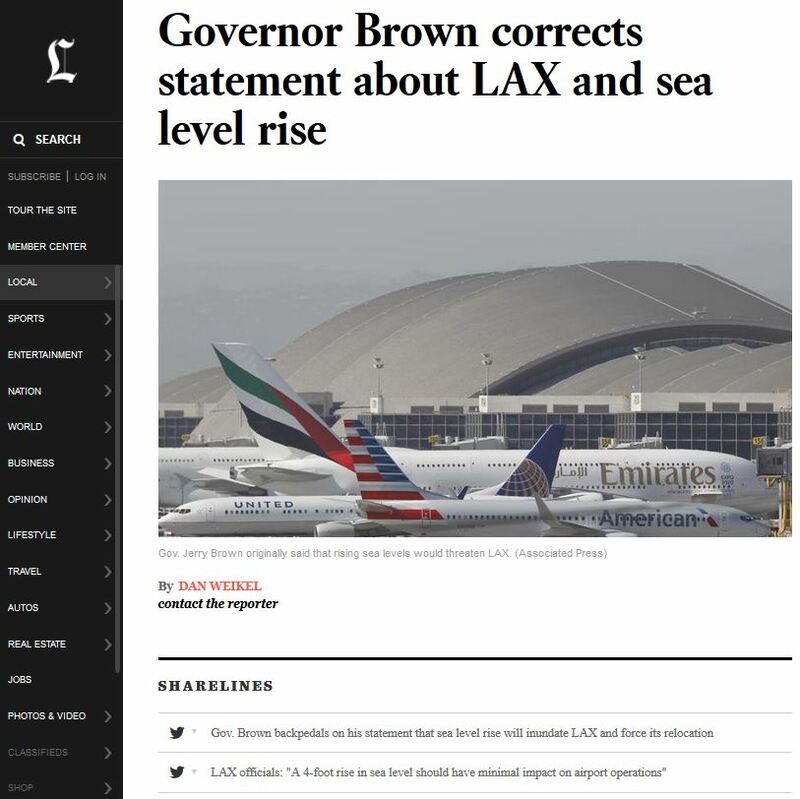 A Times story on Governor Brown’s new budget had this title “Brown says rising sea levels could force costly move of LAX” with Brown citing two recent science papers on Antarctic melt saying “If that happens, the Los Angeles airport’s going to be underwater,”. The science says otherwise. LAX airport elevation is 125 feet, the NOAA Los Angeles tide gauge rate of sea level rise 0.83 millimeter/year suggests that it will take over 40,000 years to reach the runways. On the Amundsen Sea ice sheets in Antarctica melting, NASA in their press release on the paper said: “The region contains enough ice to raise global sea levels by 4 feet (1.2 meters).” They offer a worst case scenario of the entire West Antarctic sheet melting, stating 16 feet (5 meters). Neither scenario affects LAX. Governor Brown would better serve the public by checking facts before offering baseless alarm. I didn’t get an acknowledgement from the editor, and given their “no denier” publication policy, I doubt my letter will run, even though it was entirely factual, because it made both the Governor and the LATimes look bad for not doing basic fact checking. So, at least I have that satisfaction. I urge others to follow my lead: when ridiculous claims are made in the media, challenge them with supportable facts. You may not get an acknowledgment, but the desire to not look stupid is pretty strong, and will have an effect. May 14, 2014 in Alarmism, Sea level. Never let science get in the way of alarmism! Good call Anthony! Will LAX be open in 200-800 years anyway? “Mis-spoke” Yep. Newspeak for “utterance from a standpoint of total ignorance”….but that wouldn’t sound too good. “Bold-faced BullSh*T” would sound even worse, despite it being EXACTLY that. Sir you have beclowned yourself! Unclown yourself this instance! That Tanya, is impossible for the center ring star of the “Circus” . Don’t worry, citizens of the US, you’re not alone in having politicians who can’t tell fact from fiction. Here in the UK we jail them eventually: take a bow, convicted criminal and proven liar, Chris Huhne, erstwhile Secretary of State for Energy and ‘Climate Change’. Having said that, now he’s out and has a regular column in … well, guess which national newspaper? Yes, correct in one, it’s The Guardian. Just another example – and there are so many – of populist politicians talking complete BS about so called climate change. ‘Save the World’ syndrome should become certifiable for politicians and the world would become a safer and a cheaper place in which to live. Well done, Anthony. You’re inspirational. If the Maldives aren’t worried about opening yet another new airport in 2012 then why should Los Angeles International Airport? However, mid-day I did get a nice email from somebody on the other side of the climate debate, editor Douglas Fischer of the Daily Climate, thanking me for the “good catch” and telling me that I had the LA Times newsroom “scrambling…trying to explain how they let this slip through unchallenged”. I suspect it’s because they have been conditioned NOT to question any climate claims and to actually stop doing a fundamental requirement of their journalistic profession – fact checking. Moonbeam didn’t “misspoke” (misspeak). To misspeak means to incorrectly use a word or reference when your intention was different. For example Brown could have “misspoke” if he had said LAX, but meant to say it was SFO would drown, simply mixing up or confusing the two airports in his mind. Brown clearly believed what he said at the time applied to the airports (LAX and SFO) that he cited as “threatened” by sea rise. So the Governor’s spokesman really lied to cover for his technically illiterate boss by using the word “misspoke”. What in reality the governor did was “make some crap up for sensational effect” based on the news release of the research he read and his obviously poor math reasoning skills. He thought what he said was true. He did not misspeak. That portends badly for the guy who has to figure out California’s broken finances, as California has current debts topping $300Billion (over $234 Billion of which is public worker pensions) with no identified funding source. Their new rallying cry: Not in your backyard. Terminals Inc. are sendingas much as 3.76 million tons a month abroad. benchmark price averaged 535yuan ($86) a ton as of May 11.
fighting coal exports from Oregon and Washington, said by phone May 12. The president of the Maldives wants to buy a new home for all 300,000 of his people, to save them from rising sea levels. But where on earth could they go? Maldives President: SUCKERS! Send more money now – and your tourists. 😉 LOL. News from the Maldives that work is underway on five new airports, with another three in the pipeline. Ministry of Transport and Communication has said that the delayed works on five regional airports are now underway. …. Isn’t it ironic that the screams of Warmists have actually increased the number of flying tourists, airports and hotels in the Maldives. I bet my bottom dollar the ‘co2 footprint’ for travel to and from the Maldives is up since November 2008. It’s all a big con, don’t fall for it. Governor Brown entered the state of California into what he referred to as an agreement between California, Oregon, Washington and British Columbia regarding action to combat climate change. So I contacted my congressman and senators and asked it the congress had granted the states involved a consent decree. All three said that no such consent decree existed. Clearly the states entered into such an agreement without the consent of congress. When I contacted the governor’s office I received a reply telling me that the prohibition has never been enforced. As if that means it’s acceptable to violate the constitution. The governor’s office has no intention of rescinding the unconstitutional agreement and essentially dared me to do something about it. As I do not have unlimited funds and a battery of attorneys who can keep the case from being delayed for 20 years, I guess there’s nothing I can do. The biggest weakness of the US Constitution is that there is no way for the common man to enforce it. Since the government can essentially violate it with impunity, what’s the point of even having one? Gor! Shackspear would have loved it. However, should Governor Jerry Brown have powerful friends in the airport mover industry, profuse in their campaign spending, the precautionary principle may force him to initiate moving LAX &. SFO to even higher ground anyway. If nothing else, political science tells us that much with extremely high confidence. The “no publish hate facts” in operations ostensibly dedicated to reporting fact is a brilliant cipher for why the United States is imploding and becoming a bigger joke on the world stage than it was in’77. My British Columbia provincial government has told me that it is a non binding agreement. While it is certainly true that the sea level rise from the collapse of the WAIS will not directly flood LAX the problem is that much of the access from the coast side will be affected, ie Lincoln Blvd. But it is always a mistake to get information from politicians or media which have vested interests in different directions. For the least biased assessment stick to the science. That will in all likelihood be cleaved to depending on the party identifiers involved with more dutiful solemnity than the NATO treaty. It’s galling isn’t it you can’t call it a “conspiracy” b/c they are so brazen in their extralegal execution of their “faith” it is not cloaked, nor since it is not activity based on any conclusions arrived at via reason a course of action its adherents can be swayed from. Canada is in many ways the canary in the coal mine for western civilization now, because despite its sometimes more overt periodic socialist bent it (unlike the United States) has always understood that wealth redistribution requires wealth to be created in the first place. So only the ice ABOVE sea level of that ‘grounded ice’ will raise sea level when it melts. How much is that? Be aware 400,000 cubic kilometres of ice needs to melt to raise global sea by just 1 metre. California uses about 14 billion single-use plastic bags each year, of which less than 5 percent are recycled. The state spends $25 billion to collect and bury the waste, but a lot ends up in the ocean, accounting for most marine debris. Consider the scientific argument regarding the West Antarctic ice pack. 1. The glacier is flowing by its own weight down slope and when it meets the seashore the ice pack is depressed below sea level by its own weight. The ice is assumed to have once been grounded as far as a submerged rock bar normal to the direction of motion (sill). The grounded ice pack was locked to the bedrock and moved by shear within the ice. 2. Now climate change has cause westerly winds to strengthen so that seawater is being pushed towards the shore over the sill and under the ice pack, thus lubricating the base of the ice. The ice at the sill can slide up and over and then float away because grounded ice moves more rapidly if lubricated at the base, whereas formerly it moved only by shear within the ice. 3. The novel aspect of the process is the strengthening of the westerlies, which in turn is caused by global climate change or at least by southern hemisphere warming. I have some questions that maybe somebody can answer. a. The grounded ice has volume X and if this ice were to melt, the volume of seawater would then be about 90% of X. Melting of ice that is grounded below sea level will tend to lower sea level, not raise it. c. Gravity causes the ice to flow down slope and seawards. I. Any problem would have to be with volume of ice that moves down slope and continues to be pushed offshore. Can the ice at the mouth of a glacier accelerate the movement of the entire glacier? The longitudinal profile of the top of the ice landward from the sill should indicate whether or not the entire glacier moves in response to acceleration over the sill..
Reference: Changes in the longitudinal profiles of glaciers during advance and retreat. http://www.igsoc.org/journal.old/39/133/igs_journal_vol39_issue133_pg582-590.pdf. d. The rate of glacier movement is regulated by three main factors: friction at the base of the ice, shear within the ice pack, and the net rate of accumulation of ice at the top of the ice pack. II. That if ice pack is increasing and the additional weight is forcing the ice to accelerate down slope and offshore, then this cannot raise sea level. This is because the same amount of water is being extracted from the oceans to form ice at the top as is being added to the oceans by melt water at sea level. This is the normal operation of the hydrological cycle. III. If the ice pack is not increasing, then the weight at the top is decreasing and the rate of flow into the sea is decreasing. The problem will resolve itself by partial or completer melting of the grounded ice with a fall in sea level. What happens at the mouth of a glacier cannot affect long-term sea level. This is very simple physics. Accelerating the speed over the sill will change the longitudinal profile of the glacier but will not change the volume of ice moving down slope..
Glacier ice is under a lot of compression but has low tensile strength. You cannot pull a glacier downhill. The profile will thin between the sill and the main ice pack if the front of the ice accelerates. But this will have no effect on the mass balance of the glacier as a whole. Have I got this right? Or am I missing something? If I have got it right, then this paper should be retracted. More looming problems for California reported yesterday. Extracting water for human activities is increasing the number of small earthquakes being triggered in California. John: I suspect a “lot” or “most” of the $25 billion cost comes from recycling the 5%!! “…that I had the LA Times newsroom “scrambling…trying to explain how they let this slip through unchallenged”. Based on my experience, journalists are a little mathematically challenged. I talk numbers, their eyes glaze over. If they were to raise questions about Gov. Brown’s claim then they would have had to do the math. There is that division thingy. And then that multiplication thingy. Of course if they looked at the NOAA chart there is that conversion thingy from mm to feet. At that point their head would have started to hurt. Better to just believe, for sure, the end of the world is near and Global Warming is causing it. The bigger takeaway is that due to bias toward the global warming narrative, they were all too willing to accept the assertion carte blanche without any questions. Their journalistic training took a paid leave of absence. When I saw the title, I was about to appaud Sen. for fessing up and admitting he got it wrong. But no, he does not have the guts to admit he goofed big time, he gets some “aide” to admit he “misspoke”, whatever that’s supposed to mean. Does anybody know how to gauge the impact upon the public of the original scare story, compared to the subsequent walkback retraction? One of their chief tactics is to maintain a ‘State of Fear’ as Michael Crichton so accurately identified in his best selling novel. Nearly 10 years on, this is still by far the best introduction, I know of to the whole climate scare scam. How they let it slip through is obvious. They are incompetent in their stated profession. But they are not unique in the media. Sadly, they are typical. How about either “no impact” or even “virtually no impact”? I wonder if those “environmental officials” could explain what those “minimal impacts” would be? I bet my bottom dollar the ‘co2 footprint’ for travel to and from the Maldives is up since November 2008. I wouldn’t take that bet, but Governor Brown just might. Unfortunately, as with all corrections, hardly anyone will see it, so the ‘damage’ is done and the ‘alarmist fellow travelers’ will quote this story for years to come (some of my ‘alarmist friends’ have already blared the news to me with comments like “How can you question the need to take action NOW, with all this new evidence that AGW is real.” It’s truly amazing to me how readily these folks accept pronouncements from political authority in this area, yet they fancy themselves to be ‘rebels’ against the ‘machine’. They just didn’t want to embarrass the Governor. Can you say retaliation via loss of funding if they did? At least he didn’t say he ‘misquoted himself’ as a famous NFL Wide Receiver once did. I think Hobart (Tasmania) may eventually get an upgrade to international standard too. But I don’t think Tassie is under threat from sea level rise. This is how its “supposed” to work to maintain integrity in Journalism. News Reporters are not in the business of reporting Truth. They report facts relating to a given event or situation. When they get the facts wrong they have an obligation to correct the story. They don’t always do this or bury the corrections but in this case didn’t. 2 Thumbs Up to Anthony, the Governor (via his Aid), the LA Times, and the Daily Climate. Did they respond to your blog post or your Letter to the Editor? It would be fantastic if they review your blog on a regular basis. The comment related to their “no denier” publication policy should point out that they are narrowly defining denier as individuals who deny ANY human contribution to warming/climate change and or conspiracy theory nuts. It doesn’t imply that they censor skeptical reviews/opinions which are based on facts. You ever notice that politicians fall over each other on the way to the podium to let their mouths literally drip and drool with spoken statements of impending doom but let their “people” do the talking to correct the statements that were wrong? It’s like politicians don’t come equipped with a reverse gear or brakes, they only have fast forward and turn with the tide signals. You can’t blame the LA Times. The reporter verified the Governor’s comment. It’s for sure Moonbeam said it… it’s a fact he said it. The LA Times didn’t lie. Well done Anthony. But climate scientists ought to be doing this themselves. Their failure to speak up over the hyped Antarctic story damages their credibility. Governors do not have the time to fact check everything. They rely on staff and aids to do this. It’s possible Governor Brown was confusing SLR with Atmospheric Rivers which would have an impact on the Airports and transportation. The true cause of this is a poorly crafted press release from NASA. NASA needs to dump their PR team in favor of technical communications professionals. NASA’s educational products and programs should also be Peer Reviewed before entering any classroom. The disinformation or poorly crafted information, which is likely the cause, has to stop! wise words for any situation. For any viewpoint. Thank goodness that LAX will stay stay dry for the rest of Gov Brown’s term. Putting floats on a big jet really trashes the fuel economy. My heavens! How on earth did that happen?? He was advised that there was a risk it might relocate to Texas. Thanks Anthony. It really does look like your original article and the letter to the editor was the main instigator in getting this myth corrected. Gov. Brown’s aids are obviously searching news reports and your original article makes it to the top of Google searches. And letters to the editor correcting myths does work more often than we think. Not the kind a person is trying to get published in the newspaper, but the ones that are just meant to alert an editor about when his/her news-writers are getting facts wrong. Editors are more concerned about real facts that writers are, although circulation can override this if they are targeting left-wing readers like the LA Times and the Guardian is. And there is no doubt Richard Alley contributed to Gov. Brown’s misunderstanding. Alley is appreciated by the warming set (like Brown) because he misrepresents every climate fact he can get his hands on but does it in a reassuring nerdy way. They like their myths and their reassurance. Alley’s temperature calibration of the Greenland ice cores, for example, has set-back our understanding of the northern hemisphere climate history going on 2 decades now, Younger Dryas included. .
Henry Kissinger told the story of his subordinate at the US State department quoted in the press as saying: “The Russian Foreign Minister is an A–hole.” Afterward the subordinate explained that his comment was taken out of context. Nice pic of my favourite aircraft (A380) in my favourite airline (Emirates) at LAX. Glad that LAX won’t be drowned! ….and it would take 1,000 years to get the permits to relocate it within California anyway. The Governor is obviously not a fool, so did he “misspeak” or deliberately falsify his statement? As an alarmist I’m very upset with this backpedaling. This is not in-line with our “lie and exaggerate” or “say anything” policies. We know exactly how these wild alarmist claims “slipped through” at LAT: they didn’t *have* to slip. As their “denial free zone” policy amply demonstrates, catastrophic groupthink ensures that such claims not only aren’t fact checked at all, they are encouraged. If Brown is really worried about AGW he should just shut down LAX and SFO and then he won’t have to worry about all the CO2 being spewed from those jets and airplanes owned by eco-luminaries like Richard Branson, Harrison Ford, John Travolta, et al. Thank you Captain Obvious, about the idea that it’s a mistake to get information from politicians and the media. The trouble is that those already committed to alarmist beliefs, such as yourself, will believe almost anything someone “in authority” tells them, without bothering to fact-check. As far as sticking to science, we keep telling you to, but you refuse, and your link is an excellent example of Alarmist drivel. The real question is where would you move it to and still have an airport in the LA area? I would think the governor would consider the land needed and the damage done when you build a new airport. It’s already backed up to the San Diego Freeway. I’m pretty sure there isn’t a reasonably flat piece of open real estate within 50 miles capable of supporting an international airport with its extra businesses. Try and get that one past the eco money. Excellent job Anthony!! Many comments here suggest that it is not worthwhile to try and address these issues with the press. I disagree, It is very important to make every effort to document distortions like this one to create a record of the climate fear absurdities that have been printed in the press. This record and information will be of great value in the future. Deadly sharp shooting Anthony, excellent. Based on Governor Moonbeam’s recent proclamation regarding Global-Warming/Antarctica Ice/LAX-flooding, I invested considerable moolah in the de-mothballing of Pan American Clipper Flying Boats. Now via an aide, the good governor retracts his statement. I want my money back. Does anyone know a good lawyer who can help me sue? Bonus points for anyone who can identify the oxymoron phrases in the above. Hint–there are two of them and they both contain the word “good”. The land under the runways at SFO has already been submerged by SLR, only in this case it happened at the end of the last ice age. That problem was solved by adaptation. With too little flat land near San Francisco for a large airport, SFO was constructed by filling in some of San Francisco Bay. Here is the airport today. If we could adapt in the 20th century, we can adapt in the 21st century. Chris Marlow, I am not a scientist but I’m trying. You seem to be saying there will be no sea level rise because as the above sea level ice moves into the ocean, new volumes of ice are being added back on top of the ice, creating an equilibrium. Maybe I misunderstood you. If not, the issue then becomes that aren’t we talking about the ice that has been accumulating for thousands of years. There would be no equilibrium exchange as that goes into the water. Also, I think all the focus here on sea level rise has become a red herring to the real point of the subject two studies everyone is referring to. The elephant in the room is that the ocean is getting warmer and that is what is destabilizing the glacier/ice sheet anchoring that reaches down into the ocean. Apologies for where I may have misunderstood anyone. The “Teflon effect” is in play here. Often commonly used in reference to President Reagan when a fiasco during his administration did not “stick” to him personally. Many politicians are treated this way (Brown, the Clintons, Sharpton), folks such as Paul Ehrlich, Charles – Prince of Wales, R. K. Pachauri, David Viner (no snow guy), and others. The “Teflon effect” operates in the opposite manner from the Streisand effect. After tonight’s evening news cycle Moonbeam’s mis-statement will be gone like yesterday’s tide on Dockweiler Beach. Maybe most folks won’t see Brown’s hyperbolic statement as news simply because we are accustomed to all of our politicians using hyperbole. The discussion should get back to the discussion of climate change in Antarctica. Now if we could just get similar acknowledgements about other false statements related to global warming/climate change from politicians and scientists, then support for the theory would collapse. Unfortunately, they have turned the alarmist dial up a notch in tandem with the presidents political plans to get his climate change agenda/regulations done before his term runs out. Regardless, this was one for truth, justice and the American way! The discussion should get back to the discussion of climate change in Antarctica. I agree. It’s really getting colder down there and there’s much more ice, isn’t there? That was an excellent letter you sent, and I’m glad to hear it had the reaction it did. Scrambling indeed. I think there’s going to be a whole lot more of that in the coming months and years as everyone, MSM included, try to disassociate themselves from the whole CAGW mess. This goes against everything I have ever read on the effects of ground water removal. In the Brownwood case (community near Baytown Tx) the removal caused the land to sink about 20 feet thus becoming part of the ground beneath Galveston Bay. The remains of the houses can still be seen. A test on a portion of the San Andreas midway between SF and LA that experiences lots of small quakes was done confirming the effect. A proposal was made to use this effect to have minor quakes on the dangerous portions of San Andreas but it died when the blame for triggering the BIG ONE was considered. I realize the BBC has a problem with Science but something just does not ring true about this Nature article. The damage has been done, nobody sees the retraction, it’s on page 17 not on the evening newas. Now everybody in California will be running around like Chicken Little. The journalists at Scientific American apparently have the same level of anxiety as Governor Moonbeam. Yesterday and today they posted articles on social media (Facebook, etc.) about the calamitous rise in sealevel resulting from the projected retreat of the Amundsen ice sheet. I dared to counter their distortions in the comments and found myself unfriended, deleted, and banned. I was reminded of that scene in “Planet of the Apes” where the elders held their ears so they would not suffer the pain of an opposing perspective. The elephant in the room is that the ocean is getting warmer and that is what is destabilizing the glacier/ice sheet anchoring that reaches down into the ocean. Presumably the data on that will come out–it hasn’t so far, AFAIK. It must be pretty skimpy. Who was regularly measuring the deep-water temperatures in that area in the past? I wonder if the ice-erosion could be due to the currents just moving faster. Who has or could have measured that? And in the press on the other side of the Atlantic, the main headline in (Murdoch-owned) The Times, in London, is a rather surprising “Scientists in cover-up of damaging climate view”. It goes on to describe how research which cast doubt on the severity of global warming was deliberately suppressed. I’m sure many contributors to this web-site would agree, but it’s unusual to see such a headline in a mainstream newspaper. 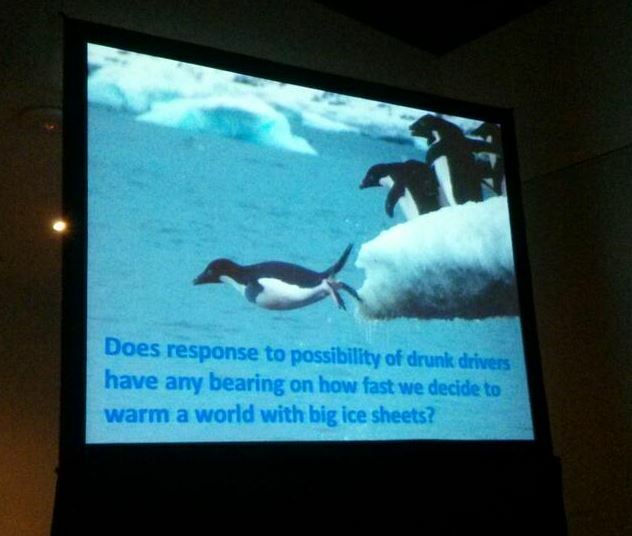 I was just hoping someone could explain “Does response to possibility of drunk drivers have any bearing on how fast we decide to warm a world with big ice sheets?”. That photo and caption has been driving me crazy. It almost sounds like random words using a computer program with grammar rules and a dictionary. Well protection by “coastal bluffs” simply determines how deep the water will get, in the swimming pool, when the ocean decides to come ashore in a storm. New Orleans is protected by “coastal bluffs”, but hurricanes go up to tens of thousands of feet. When running a boat in heavy seas, you want the drain plugs out; not in !! Well I suppose they could always move LAX to Long Beach Harbor. They have video evidence that you can fly the biggest aircraft, anyone wants to build, out of LBH. They might be backpedaling, but NASA isn’t.